Germans are know for their traditional German cousine around the world. What many people don’t know is the fact that German cuisine is so much more than just sausage and meat. 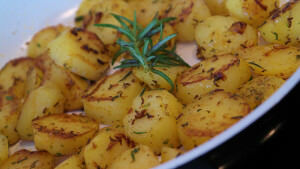 Depending on where in Germany you stay you will find a big variety of traditional and comfort foods. 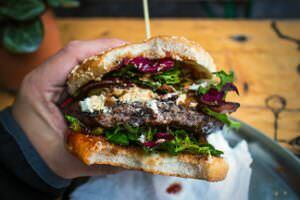 The area around Hamburg is know for fresh fish dishes (don’t get fooled by our picture here, even though the Hamburger is named after this city it is not a traditional dish) while the South is known for all types of foods made of pork. Funny enough, but the most famous German dish, Spätzle, is completely vegetarian. Spätzle are a kind of pasta, but the dough only consists of eggs, flour, salt and a hint of fizzy water (in order to fluff up the dough). Swabians are very proud of their Spätzle, so better not call them German pasta. 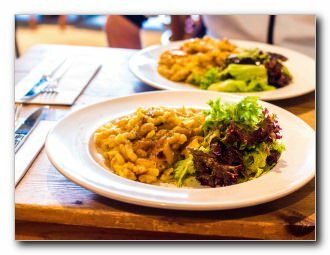 Traditionally Spätzle are served as a side dish to meaty dishes (like Schnitzel) or can even be a main dish themselves. The most famous way of preparing Spätzle is to top it with a huge amount of cheese (mountain cheese for the taste and some Limburger for the consistency) which is called Käsespätzle. Spätzle originally come from the area around Stuttgart and are part of most Swabian dishes. It is not surprising that already on our second place we have a dish made of pork. Bratwürste are part of every German barbeque and also differ from area to area. The most famous Bratwürste are for sure the short and thin ones coming from Nürnberg. Grill your Bratwurst for 2 minutes on each side, put it in a bun, add some ketchup or moustard and ready is this iconic German dish called Bratwurstsemmel. Outside of Nürnberg Bratwürste are bigger and contain more fat. 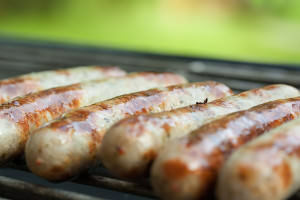 But no matter which size, Bratwürste are part of every German barbeque party. 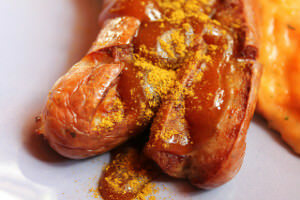 Another sausage in the top 3 of our Top 10 things to eat in Germany list, the world famous Currywurst, is an institution in Berlin. Invented in Berlin by Herta Heuwer in 1949 the Currywurst is usually made of a pork sausage either wrapped in ‘Darm’ (better not to Google what Darm means as otherwise this might put you off a bit) or without Darm. Cut into thin slices the sausage now is covered in a mix of Ketchup and some curry powder. And ready is your first German Currywurst. Traditionally you will eat the Currywurst accompanied by some french fries or a plain white bread. Believe it or not but in Berlin there is even a museum that is completely dedicated to Currywurst. Berliners really are very serious about their Currywurst. Germans sometimes are reffered to as ‘Kartoffeln’ as a joke, because it seems that everyday a German is having at least one dish which contains Kartoffeln. While this stereotype is not true, it is true that Bratkartoffeln are an excellent way of eating your portion of Kartoffeln in Germany. Slice up some boiled potatoes, slice them thinly, put them in a frying pan with a lot of oil, bacon and onions and fry them until they turn dark and crispy. Not the healthiest option on our Top 10 things to eat in Germany but definitely not the worst as well. Sauerbraten is a dish that you will usually get served when visiting the grand parents or on a special occasion. To prepare a Sauerbraten you will need some high quality piece of beef and a lot of time. The meat is put in the oven and cooked slowly in its juices for hours and hours. But the slow cooking in low heat will make the meat incredibly soft and tender. Rumour has it that back in the days some monks, who were not allowed to eat any meat during feasting, covered some meat in kind of a pasta dough so that God could not see that they are eating meat. No matter if that story is true or not, but believe us when we say that this Swabian dish is another fantastic thing to try while in Germany. 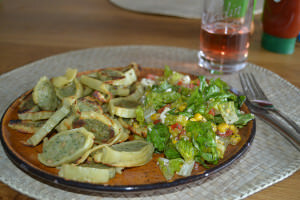 Maultaschen are either boiled or fried and come with all kinds of stuffing like pork, beef or even a veggie option. Of course another dish made of pork meat is Leberkäse. 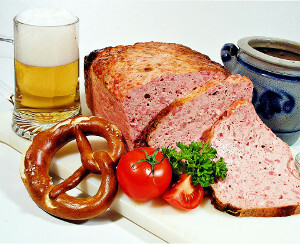 Leberkäse is usually rather served as a snack during the day rather than a real meal. Leberkäse is more a kind of a sausage that is put in the oven for a long time, then sliced and served with white bread and sweet moustard. Very tasty but also very heavy and probably not the healthiest of all German foods. 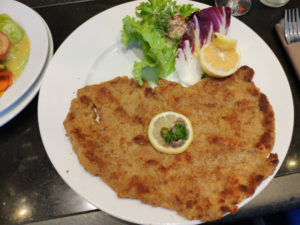 The most famous version of Schnitzel is definitely the Wiener Schnitzel, which is a thinly sliced piece of veal-meat, covered with flour, egg and bread crumbs and then deep fried in oil or a lot of butter until it turn golden on the outside. Also very tasty is the Schnitzel Wiener Art, which is basically the same but with pork meat. But there are many more options on how to prepare a Schnitzel which range from chicken breast to soja to blocks of cheese. We are open to discussion here who really invented the Schnitzel, may it be the Austrians (after all the Wiener Schnitzel is called after their capitol) or even the Italians with their love of Escalopes. If you ever want to cook Rouladen yourself we strongly advice you to go to the butcher and ask him for some ready made Rouladen in order to save you a lot of work. If you want to prepare them the traditional way you need some thinly sliced beef meat, put some moustard, onions, ham and a pickle inside, roll them up and put them in the oven to cook in a sauce for some hours. But there are hundreds of different recipes going around for Rouladen. 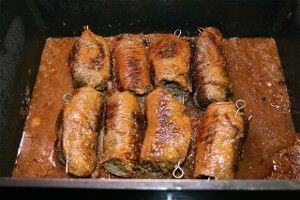 One tasty example is Rouladen greek style with Feta cheese inside. Rouladen are extremely tasty but unfortunately they are very time consuming to prepare. One could argue that Gulasch is not really a German invention, but nevertheless the Germans love their Gulasch and may have taken the original recipes and turned them into som variations of their own. Gulasch is made with thick pieces of beef meat that have been slow cooked in a rich sauce, sometimes made of red wine, which makes the meat very soft and tender. Gulasch can be eaten as a soup or with some side dishes like Spätzle. 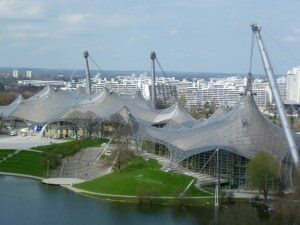 Once you have learned about the most famous German dishes it might be time to learn about our Top 10 sports in Germany. 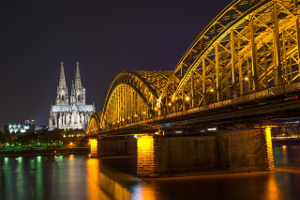 If you have already decided that you will move to Germany soon you might also be interested in finding out which German bank is best for you.